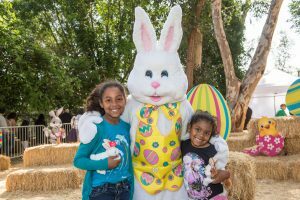 BIG BUNNY’S SPRING FLING at the Los Angeles Zoo celebrates the season with three bountiful days of “EGG-citing” adventure on Friday, April 14, Saturday, April 15 and Sunday, April 16, 2017, from 11 am to 4 pm. Fun for youngsters includes opportunities to examine eggs of different animals, seed-planting crafts, face painting, musical entertainment by Kiddle Karoo’s Easter Show, costumed unicorn princess and fairy characters, photos with a “Big Bunny” character for a nominal fee and a special Ranch Talk to learn about and interact with the Zoo’s sheep. Adding to the excitement is Bubblemania, a “hands on” bubble-making experience for guests featuring bubble wands that look like flowers, butterflies, dinosaurs, dolphins and more. For more family fun, a Dance Block Party features a live DJ (11 am to 4 pm) and breakdancing demonstrations. Guests also discover the complexities of reptile egg laying and incubation during talks in The LAIR (Living Amphibians, Invertebrates, and Reptiles) exhibit at 11 am and 2 pm. Rounding out the activities are an “EGG-ucation Station” to give inquisitive guests a chance to see a bunny’s sensory and grooming habits, as well as the opportunity to learn about care for real bunnies, which are available for viewing at 10:45 am, 11:45 am and 12:45 pm. All events are free with paid Zoo admission, except “Big Bunny” photos, which are available for a nominal fee.